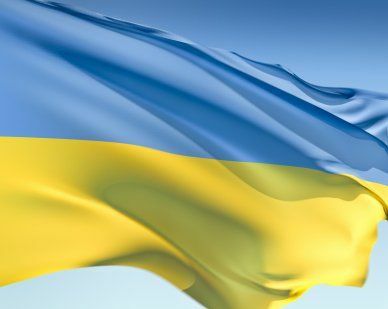 The Ukraine flag has seen many changes throughout its history. In the 13th and 14th centuries the Halych-Volhynia banner was flown. It was blue with a yellow standing lion in the center. In the 16th and 18th centuries the Cossack Hetmanate flag was used. It had a blue background, yellow border and the Cossack coat of arms in the center. The coat of arms was blue, yellow and crimson. From 1917-1921 the Ukraine People’s Republic flag was flown, featuring two horizontal stripes of blue and yellow, with an insignia in yellow in the top left corner. From 1918-1919 the flag was flown without the insignia. From 1919- 1991 communist flags were flown. In 1991, Ukraine again had its own flag, which features two horizontal stripes f blue and yellow. This is the flag that we know today. Our top-quality Ukraine flags conform to all official specifications. Emblems and designs are executed with the highest possible degree of accuracy in regard to detail, color shades, placement and proportion to flag size.